This 17th Century Hotel, originally known as the Ship & Castle, has certainly had an interesting past. Much of the original building was destroyed in a Spainsh raid in 1595 and remnants of the subsequent fire can still be traced in the exposed stonework in what is now the main bar (it is probably more obvious to a forensic scientist though). At one time, the Hotel boasted one of the country�s oldest theatres (remnants including the stage still remain within the building�s structure although the theatre itself closed in the 1820�s). There is still a theatre bar tucked away in the rear of the building with several old theatre posters but this section appears to be used primarily for functions and special occasions. 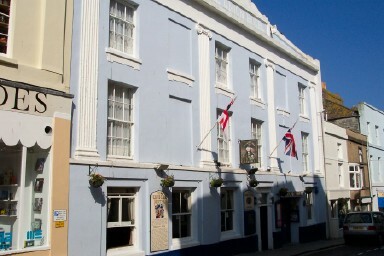 The pub�s big claim to fame is that during a ball in 1805, the local mayor became the first person to publically proclaim victory at the Battle of Trafalgar and the subsequent death of Nelson (although I have heard that Falmouth also claims to have been the first town to have received the news). As a result, the hotel plays on its Nelson theme quite heavily with a lifesize model greeting you as you enter the main door, articles about the battle of Trafalgar (which includes a comprehensive list of official casualties) and several battle scene pictures. The main bar is also named the Nelson bar in his honour whilst the main restaurant honours Lady Hamilton. Whilst the history may be impressive, the pub falls short in other areas. The interior still has plenty to admire; impressive fireplaces, original stone work, old beams etc, but it is let down by its obvious attempts to attract the sort of customer base who probably have little or no appreciation of the building or its history in the first place. The main gripe is the music which was on the whole geared towards the younger crowds. There is something that feels so wrong about sitting next to the wonderful fireplace, wallowing in great naval battle scenes and soaking up the building�s past whilst listening to rap music! The live music was pretty intrusive and on a Saturday night you can expect a band slap bang in the middle of the main bar. The beer selection also is not particularly exciting � 2 ales (Bass & Sharpes Own) albeit perfectly acceptable quality. The rear section between the Nelson Bar and the restaurant seems a bit out of character to the rest of the building and you get the impression that the place should be so much better than it is. That said, it is certainly worth a quick pint merely for its historic interest but probably best done away from peak times when hopefully the ambience is a bit more fitting for the building. Improved recently with decent food, Being smoke free from 1st July will greatly improve ambiance as very smoky in bar biggest fault. On the evening we spent in here all the staff were decked out in 18century costume which added to the atmosphire in the historic pub. Some live music of the acient type helped to create the right environment.